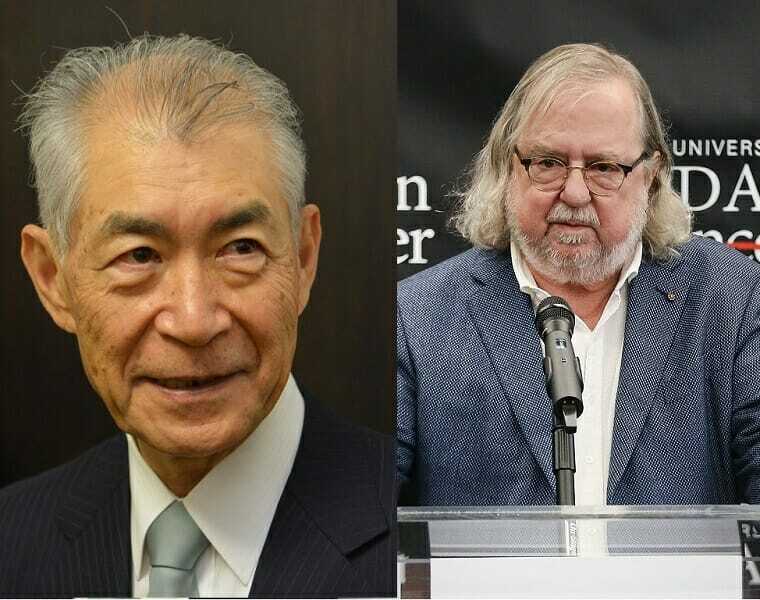 The 2018 Nobel Prize in Medicine winners Tasuku Honjo and James P. Allison. Images courtesy of Wikimedia and Getty. When two cancer researchers received the Nobel Prize in medicine earlier this month, the award committee recognized a pair of ‘90s-era breakthroughs that led to one of the most significant marketing duels of the 21st century. James Allison and Tasuku Honja made separate but seminal discoveries involving CTLA-4 and PD-1, respectively, two proteins that act as a brake, or check, on tumor-fighting T-cells. They found that by stopping those brakes — via antibodies that inhibit the proteins — the body’s own immune system could be unleashed to attack cancer. If the 1990s saw the dawn of checkpoint inhibitors, the next two decades formed a no less seismic chapter in the history of oncology R&D. In this period, particularly the last five years, groundbreaking clinical results have been translated into novel treatments capable of extending overall survival for a growing number of cancer patients. Driving the progress is immunotherapy, which fights cancer by deploying the body’s own immune system. Allison’s work paved the way for the eventual development of ipilimumab (Bristol-Myers Squibb’s Yervoy), an antibody which blocks the CTLA-4 protein on T cells, while Honja’s findings spawned the development of pembrolizumab (Merck’s Keytruda) and nivolumab (BMS’s Opdivo), both of which block PD-1. Checkpoint inhibitors’ reach is far more extensive: The category of drugs has generated a large body of positive clinical data and garnered more than a dozen indications since 2011, when Yervoy, the the first checkpoint inhibitor, was approved by the FDA for treating metastatic melanoma. The rate of progress kicked into high gear with the approval of PD-1 and PD-L1 checkpoint inhibitors, starting when the agency greenlit Keytruda in 2014 for advanced melanoma patients who had already tried other therapies. When an immune checkpoint is triggered, T-cells stand down. Cancer cells can take advantage of this, activating checkpoints and thereby growing undisturbed by the body’s immune system. Checkpoint inhibitors work by disrupting the process, enabling the immune system to attack cancer cells. Since 2014, there have been a flurry of approvals for PD-1 and PD-L1 therapies. “Over the past five years these drugs have completely revolutionized the oncology market landscape,” said Andrew Merron, executive director, oncology and biosimilars at Decision Resources Group (DRG), a healthcare research and consulting company. In addition to melanoma, PD-1 and PD-L1 drugs have gained approvals in a number solid tumors, as well as hematological malignancies. “We’ve had some pretty amazing approvals in tumor types that we haven’t had approvals in for a long time,” said Haris Vikis, senior consultant at Kantar Health, including small cell lung cancer and cervical cancer. Unsurprisingly, there is a frenzied effort to produce additional research: Vikis estimates 50 new PD1 or PD-L1 inhibitors are in clinical development. “There are a lot of players who have assets they are hoping to commercialize,” he said. Immunotherapy’s modern era began in the early 2000s, according to Jeffrey Weber, deputy director of the Perlmutter Cancer Center. That’s when BMS first began testing CTLA-4 antibodies in patients, which led to the development of Yervoy. While the drug displayed activity in melanoma, “disappointingly it didn’t have much activity in other tumors. In fact it was pretty much nil in any other cancer,” Weber said, leading researchers to turn to other molecules that inhibit T-cell activity: PD-1 and PD-L1. While only active in a selective number of mouse models, “when you tested it in patients, they had significant activity” in many types of cancer, Weber said. BMS pursued the rapid development of Opdivo, its PD-1 inhibitor. Shortly after, Merck began developing Keytruda, its own inhibitor that used a PD-1 antibody acquired in the company’s 2009 purchase of Schering-Plough. Despite a delayed start, in September 2014, Keytruda became the first PD-1 inhibitor approved by the FDA. “It was a very fast development, from first-in-man in April 2011 to approval [for advanced melanoma patients] in September in 2014,” said Scot Ebbinghaus, VP and therapeutic area head, oncology clinical research for Merck Research Laboratories. Less than four months later, Opdivo was also approved for advanced melanoma in the U.S. The drugs paved the way for the subsequent approval of three PD-L1 inhibitors: Roche’s Tecentriq (atezolizumab), Merck KGaA and Pfizer’s Bavencio (avelumab), and AstraZeneca’s Imfinzi (durvalumab). Today, PD-1 and PD-L1 therapies are approved across 13 indications — renal, head and neck, gastric, hepatocellular carcinoma, Hodgkin lymphoma, among others — and have received more than 30 label expansions. Both numbers are expected to grow: In 2018 alone, more than 490 new clinical trials have been registered for these five drugs, DRG’s Merron said, including studies that are investigating new indications. Their impact is already enormous. “I’ve been treating lung cancer for 25 years now, and I’ve never seen such a big paradigm shift as we’re seeing with immunotherapy,” Dr. Roy Herbst, chief of medical oncology at the Yale Cancer Center, told The New York Times. He was speaking specifically about a recent study that showed advanced NSCLC patients who received Keytruda in combination with chemotherapy were half as likely to die after 10.5 months than patients who received chemotherapy alone. The study spotlights one of the major development in immunotherapy over the past few years: combination trials. “I think one of the big themes is, ‘How can we improve on single-agent checkpoint inhibitors?’” Kantar’s Vikis said. The question has spurred a large body of research that combines PD1 or PD-L1 inhibitors with other immunotherapies or chemotherapies. Of the 490 PD-1/PD-L1 trials filed in 2018, the vast majority are combination studies. According to Ebbinghaus, there are currently about 400 trials studying the effect of Keytruda in combination with other anticancer drugs and therapies. While checkpoint inhibitors, particularly PD-1 and PD-L1s, have made incredible strides over the last decade, many basic questions remain unanswered. Researchers still don’t know why the treatment works miraculously in some patients — in extreme cases, it can literally melt away tumors — and not in others. It’s all too easy to meet a patient who would have died if not for a revolutionary immunotherapy treatment and “universalize the experience,” said Gil Bashe, a managing partner at Finn Partners. But immunotherapy does not work for the majority of cancer patients. In NSCLC, the response rate to PD1 as a monotherapy is about 40%, and rises to more than 50% when the therapy is combined with chemotherapy. Efforts are underway to better determine whether a checkpoint inhibitor will be effective for individual patients. There are a few leads, of which PD-L1 status is the most prominent. “Generally patients with higher PD-L1 levels do benefit more from a checkpoint inhibitor therapy,” Vikis said. But it’s far from perfect indicator: patients who do not express PD-L1 sometimes benefit, too. Initially, Merck stratified lung cancer patients, focusing on those with high levels of PD-L1 expression. But subsequent combination trials of lung cancer patients, including Keynote-189 (presented at AACR 2018) and Keynote-407 (presented at ASCO 2018), showed survival benefits independent of PD-L1 status, leading to an approval in NSCLC untethered from the biomarker. “My perception is that we’ve laid a foundation,” Merck’s Ebbinghaus said, adding that he expects that more late-stage studies showing overall survival benefits will be published over the next few years as combination studies bear fruit. Immunotherapy will also likely reach a wider pool of patients for existing indications. Thanks to the strength of the data coming from Keytruda and Opdivo particularly in combination trials, the question becomes, “Why not treat patients who have cancers in earlier stages? That’s where emphasis is going,” Vikis said. If combination therapies are shown to be effective in second and third-line treatments for metastatic cancer, more could be approved in a first-line setting. “Instead of waiting for the cancer to metastasize, it’s interesting to think about giving immunotherapy after surgery for cancer to prevent it from ever becoming metastatic in the first place,” Ebbinghaus said. Finally, despite their success, researchers are looking beyond PD-1 and PD-L1 inhibitors, both as a monotherapy and to be used in combination with other drugs. “We have a very interesting early pipeline of compounds that complements our late-development platform, including anti-LAG-3 and TIGIT,” Ebbinghaus said. As the flood of clinical trials continues, both Merron and Weber worry some companies are moving from early-stage trials to phase II/III too quickly, without adequate data. “There have been some instances where hurried clinical development has resulted in poor outcomes,” Merron said. In April, a phase III trial that combined Keytruda with Incyte’s new cancer drug epacadostat failed. For now, Keytruda and Opdivo continue to dominate the category. The two drugs have been neck and neck in approvals, although Merck’s initially more careful approach is looking increasingly savvy. In the beginning, the company focused on patients with high PD-L1 expression, limiting its reach and putting it behind Opdivo in sales. But as Keytruda continued to collect strong data based on a stratified patient population, its approvals grew in number and scope. From a quarterly earnings perspective, he might very well be right. But zoom out, and it’s clear that not only is the race far from over, but BMS and Merck are not the only competitors. “I remember at ASCO when BMS was first coming out with Yervoy and then Opdivo, this sense of, ‘Can Merck ever catch up to them?’” Bashe recalled. The war on cancer is long. The past five years have been an exciting chapter, to be sure, but more developments are brewing and the financial status of individual companies will rise and fall on the back of new, innovative research.